PEMF Depression and Pain – There is Hope! These may be your feelings: I am depressed. I am in pain. I find that I am more Joyful, more Relaxed, when I am in Nature. Nature helps with Depression. PEMF (Pulsed ElectroMagnetic Frequencies) help with Depression. PEMF uses the frequencies of Nature, to relax you, to bring you into balance. 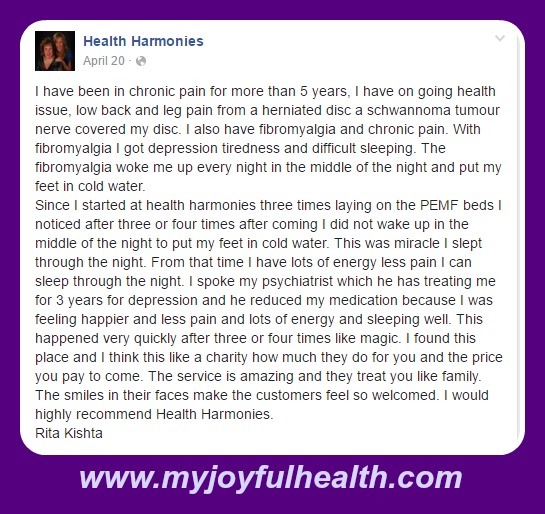 “I have been in chronic pain for more than 5 years. I have ongoing health issues, low back and leg pain from a herniated disc, a schwannoma tumour nerve covered my disc. I also have fibromyelgia and chronic pain. With fibromyelgia I got depression, tiredness and difficulty sleeping. The fibromyalgia woke me up every night in the middle of the night and put my feet in cold water. 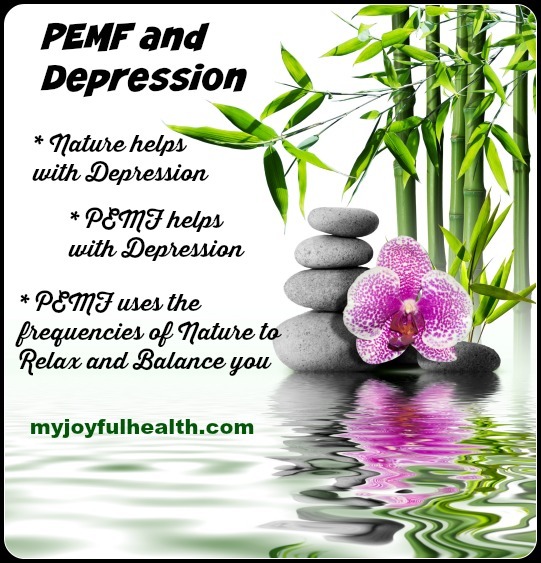 PEMF Depression and Pain, Fibromyalgia, Tired all the time – There is lots of Hope for Joy, Peace and Balance with PEMF for Depression Omnium1 Mat. For a long time, not much was known about depression. Those who thought they had it hid it out of shame. Now that more is known and treatment is viable, being proactive is a vital part of the process of the awareness of depression. Know if you are at risk. What is risk? In the case of depression, it means that you are predisposed to the symptoms that lead to the condition. Because of the different phases of a women’s reproductive life, hormonal changes occur more often than they do in men. This also means that there are more chances for depression to become an issue. Contraceptive use – There are many risk factors involved with taking oral contraceptives. Ones that contain high progesterone content are looked at in particular. Levels of progesterone are thought to be the reason that stress hormones continue to be secreted instead of being stopped during periods of stress. Switching to another pill or another form of contraception is advised. History of abuse – Sexual and physical abuse especially during childhood can lead to depression. Counseling after the event can help sort out feelings. Loss of a parent – Losing a parent early can be confusing for a child. Talking and using counseling to deal with the loss can help thwart a bout with depression. Multiple births – With each pregnancy, there are hormonal changes that can bring about postpartum depression. Consider talking to a doctor about proactive ways of limiting these results during and after pregnancies. Family history – Know your history. When you know depression is a real possibility, you can discuss ways to prevent it from occurring in your life. Premenstrual issues – Most women experience hormonal changes during their period and then they leave. Some have symptoms that make it almost impossible for them to function in their lives during this time. There are treatments for PMDD that can help keep depression from becoming a factor. Infertility – Just the stress of some of the procedures can lead to depression. Also, certain treatments lead to hormonal changes. Knowing the risk factors helps in a positive way. Head off depression before it becomes an issue. Let’s get down to the main differences between male and female symptoms when it comes to depression. Where they exhibit some of the same, the manifestation in women is more pronounced and profound. Men on the other hand, are polar opposites in all these areas. For instance, they blame others for their situation instead of blaming themselves. And, they feel talking about their feelings shows weakness so they don’t indulge. Recognizing that there are differences between men and women regarding depression is a plus. It can increases proper diagnosis and effective treatment.